Whether it's in a car, on a boat, or on an amusement ride, motion sickness can happen at any time. Your brain doesn't always receive the same signals that are received by the muscles in your body, resulting in feeling sick while you're in motion. You can clearly see that you're moving, but your brain doesn't register this fact. One way to combat this feeling is to try to sleep as much as you can while traveling or get behind the wheel of the car. If you are looking for a sporty, convertible roadster, take a look at the Mercedes-Benz SLC 300 Roadster available at Kempthorn Mercedes-Benz. This is a stylishly designed roadster that has a powerful engine. This vehicle is designed to give you top performance while driving, and you will look great heading down the road. Perhaps the most iconic Mercedes-Benz vehicle is one of its luxury sedan models. Combining stellar performance with understated luxury and supreme comfort, they allow drivers to arrive in style. The E Class 400 offers a spacious interior and aerodynamic exterior design for a ride with plenty of visual appeal. The flowing, sculpted lines of the E400's exterior match harmoniously with its spare but luxurious interior. The front grille highlights the Mercedes-Benz brand badge in prominent chrome, balanced on either side by wrap-around LED headlights. The Mercedes-Benz Certified Pre-Owned Vehicle program is an ideal way to get a good used car at a good price. This program, authorized by Mercedes-Benz, eliminates the worry about being stuck with a lemon because these certified and pre-owned vehicles come with warranties. Take a trip to Kempthorn Mercedes-Benz, check out the vehicles and get all the information you need. To be certified by Mercedes-Benz, the vehicle must not have more than 75,000 miles or be older than six years old. It must also pass a rigid inspection including 165 points. It is no secret that Mercedes-Benz has a reputation built on premium styling and impressive performance features. The Mercedes-Benz E 450 is the perfect example of this commitment to excellence. The E 450 aficionados at Kempthorn Mercedes-Benz welcome the opportunity to welcome you into our showroom and introduce you to the beauty of this popular luxury wagon. The minute you sit down in the E 450, you will be enveloped with the thrill that comes with being inside a Mercedes-Benz. The power front seats with memory make driving both comfortable and convenient. Driving just after sunrise and before sunset on a clear day can result in a safety hazard created by the sun's glare. When the sun shines directly in a driver's eyes, the ability to see the road becomes compromised. At Kempthorn Mercedes-Benz, we're offering customers the following tips for reducing the problem of glare and increasing driver safety. When it comes to the car battery in the winter, the temperatures can get deadly. Therefore, you are going to have to do everything you can to prevent problems with your vehicle. The winter weather can cause a lot of problems in your vehicle that can get it to quit working. Mercedes-Benz owners choose the company's vehicles due to the luxury and prestige they offer. The mid-sized Mercedes-Benz GLC 300 4MATIC SUV is no exception. The vehicles have an abundance of technological features designed to enhance ownership experience. See the 2019 models and the options they offer at our Canton showroom. 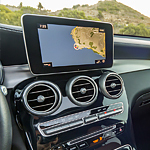 The Mercedes-Benz GLC 300 multimedia options include an infotainment system equipped with an 8.4-inch screen, DVD/CD player and touchpad control technology. Control the system manually or use the voice command option. People look to their vehicles in order to be connected as well as mobile. The 2019 Mercedes E 450 4MATIC Wagon is one of the vehicles that has a wide range of multimedia features that can enhance the enjoyment of your ride while giving you high quality entertainment. 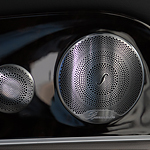 One example of the multimedia features of the 2019 E 450 4MATIC is the option of Apple CarPlay and Android Auto. This allows you to connect your vehicle with your smartphone so that you will be able to access the apps from your vehicle. Why is Your Tire Pressure Light Illuminated on Your Dash? There are going to be times, no matter whether you are in Chicago or Canton, when your tire pressure light is going to come on and you're going to wonder why. The obvious answer is that your tire pressure is a bit low and this should always be the first thing you check. If you have indeed checked that and found there not to be a problem, your next choice is that there might be something wrong with the sensor itself. If you have used something like "Fix a Flat" in the past, this might have done something.